I just couldn’t stop baking with pumpkin that easily! Although Fall is sadly over, and we are now in the midst of the snowy weather season, I just couldn’t resist baking some more goodies using pumpkin. I had one can of pumpkin left over so I decided to whip up a batch of these gorgeous, soft & chewy Pumpkin Gingersnap Cookies. 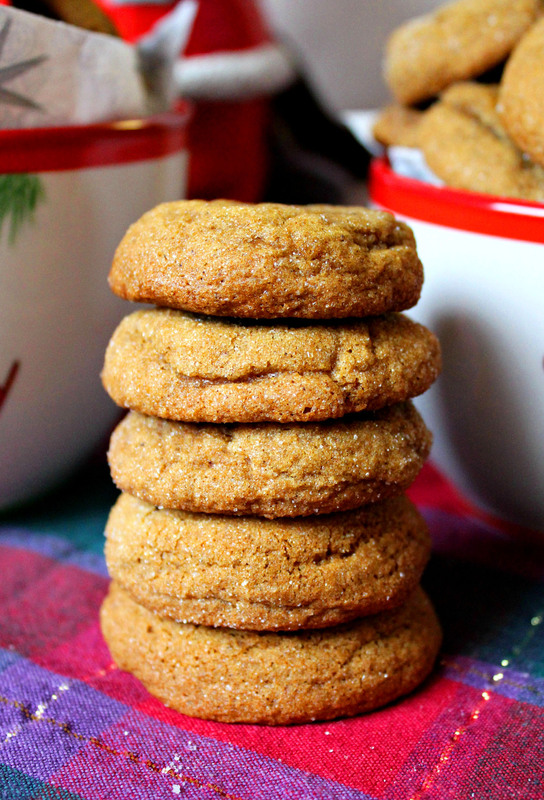 I love the combination of the flavorful pumpkin with the usual Gingersnap spices (ginger, cinnamon, & cloves). 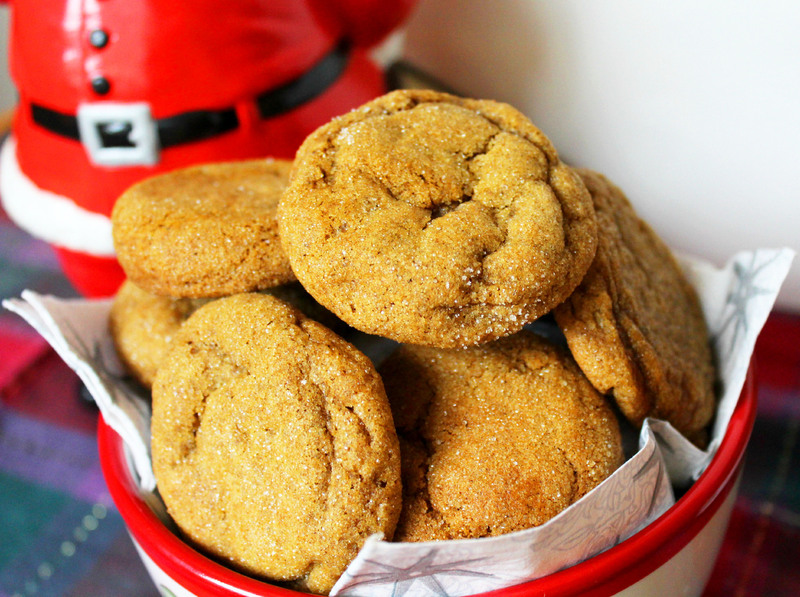 It makes for a perfect, spicy Winter cookie! The pumpkin helps keep these cookies super moist, and really adds a nice punch of flavour. I like to roll the cookies in sugar before baking because it adds a little more sweetness, and it also makes the cookies sparkle & look really pretty which is always a plus. 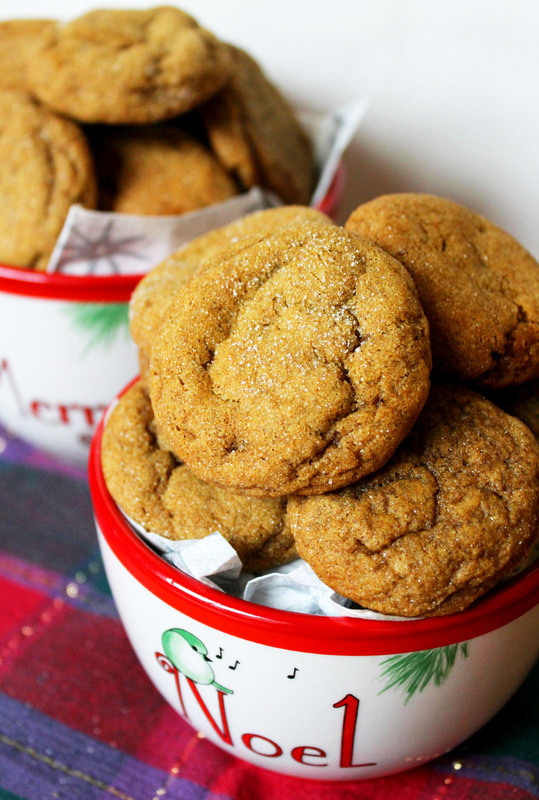 If you like gingersnaps, you will love these cookies. They are a staple in our Fall & Winter baking, and we hope you enjoy them as well! 1. In the bowl of your stand mixer fitted with the paddle attachment, cream the butter & sugar together on medium speed until light and fluffy. Add the pumpkin, molasses, egg, & vanilla extract and mix until well combined. In a medium bowl, whisk the flour, baking soda, cinnamon, ginger, cloves & salt together. Add the dry ingredients to the wet ingredients and slowly mix until combined. Do not overmix. 2. When ready to bake, preheat oven to 350 degrees F. Line or spray baking sheets with non-stick cooking spray. Place 1-2 cups of sugar in a small bowl. Using your hands, roll dough into tablespoon-sized balls than roll balls into the sugar until well coated and place on prepared baking sheet approx. 2 inches apart. Bake for only 10-12 minutes. The cookies will look very soft, and almost underbaked. That is what you want – do not overbake. Let cookies cool on the baking sheets for about 5 minutes, than transfer to a wire rack to cool completely.